The July 29, 1944 issue of the Chicago Defender carried this photo of Fisk student, Miss Helen Hortense Tildon of Tuskegee, Alabama. 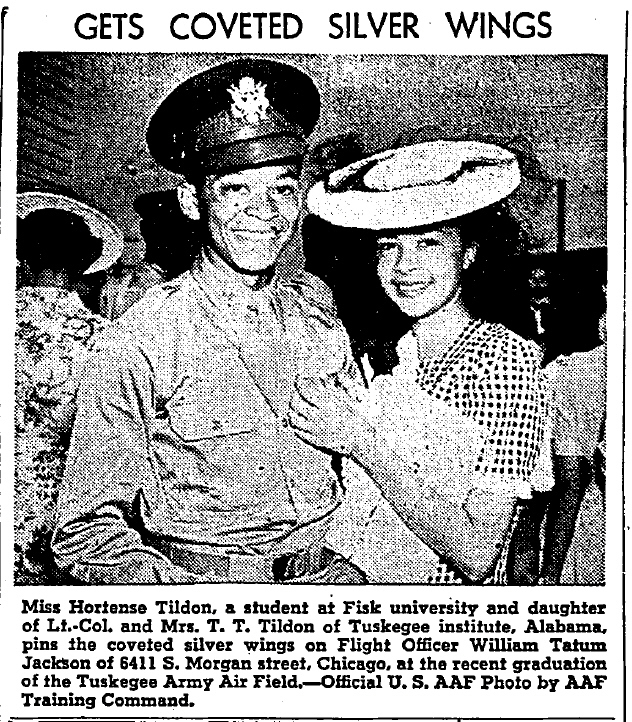 Miss Tildon is the daughter of Lt. Col. Touissant T. and Margaret Tildon. The family is from Tuskegee, where this picture was taken, where I find 4 year old Helen H. enumerated with parents and brother Touissant Jr. Her father is enumerated as a physician and was born in Texas. He was a pyschiatrist and graduated from Harvard Medical School in 1923 and would spend most of his career in Tuskegee. [Black Psychiatrists and American Psychiatry]. Harvard has an online resource called Against All Odds that includes a biographical sketch about her father – click on the “Part Two: Biographical Sketches” to find it. It appears though that the family last name may have been Tilden. 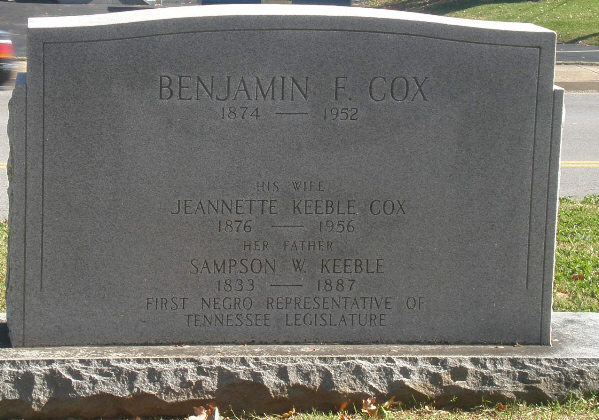 Sampson W. Keeble was the first African-American to serve on the TN State Legislature. He represented Davidson County from 1873-1875. Earlier this month I was out at Greenwood Cemetery and happened upon his grave. As you can see, he is buried with his daughter and son-in-law. The Tennessee State Library & Archives has an online exhibit of black legislators from Tennessee in which Keeble is included. His bio has several details about his personal life and legislative career. 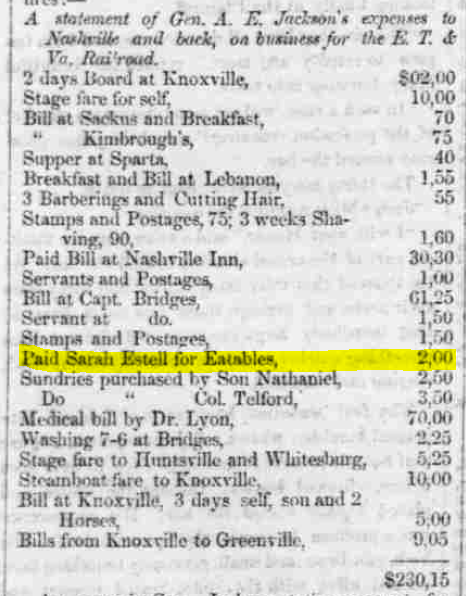 The bio mentions that he last appears in the Nashville City Directory in 1886, and now that Ancestry has Nashville City Directories now from 1879-1899, I was able to quickly look him up. Looks like he lived at 100 N. Spruce St. Given how new his headstone is, and given that a previous bio of him indicates it was now known where he died, I suspect this marker may have been recently done, perhaps in conjunction w/ the TSLA exhibit? In the March 1, 1907 issue of the Nashville Globe, Rev. Preston A. Taylor recounts a trip to Tuskegee, Alabama. Tuskegee is an international word known and read by all men on either side of the waters, and everybody feels the keenest interest in the institution, be he white or black, for education is blended into all nations alike. If the brother in black is ignorant his shadow falls on his white brother and God has made of one blood all nations though the skin may be white, black or red and yet the blood unchanged and that is what is the interest of one man must be the welfare of all. From the time the Emancipation Proclamation was put in force until now the races have been contending for more light and wisdom and it believed to be the best money a parent can spend on his children. The same money given to a heir might be used as the Prodigal used his; but an educated person can’t spend his education. He must hold to it. Though he may not use it to the best advantage, yet he can’t be counted as one without refinement. Education is good for all; though he may be a prisoner of a free man, rich or poor, white or black, he can find enjoyment in intelligence. If education made George Washington a great man, why should it be thought strange that it should make Booker Washington a great man? The same advantage given to all alike must surely produce a nation of great and useful people. Some nationalism will be greater than others, the same as ours, some seed sown produces greater harvest than others. Some soil is better, some has a greater advantage in the season and some has better attention than the other. This is well illustrated by our great men and women of the race. Any one can easily use what education has done for our race. Will it not compare favorably with any other people under the same circumstances? We have furnished our ratio of farmers, merchants, business and professional men. The race has always stood side by side with other races to do its duty whether in the time of peace or war, and if our good deeds were as widely published as our bad ones, in what a different attitude it would place us before the world. I for one would not object to our bad being told if the good we are doing could only be known; as it is told of Martin Luther while bound in prison, the “devil” wanting to add to his misery said, “Don’t you know you are a sinner, an insurrector, a preacher of false doctrine and a bad man in general?” Luther said, “Grant all you say is true if you will add these words, ‘The blood of Jesus Christ cleansed from all sins,’ granting that all is said of us is true.” If the world could only know what Tuskegee is doing for the uplifting of humanity, we would be willing to rest our case with them. Tuskegee is a city of schools, consisting of twenty-three hundred acres of land with eighty buildings, and the grounds are inhabited by about three thousand people of the race. Tuskegee, Ala., is forty miles east of Montgomery and is one of the most beautiful towns in the state, situated on a site overlooking all the adjacent territory. The scenery about it is not excelled in all the South and seems just adapted for the purpose it is used for. The farming is done largely by the students on a scientific plan, with heir hundreds of mules, horses, plows, barrows, wagons, carts and other implements. They cultivate this immense tract of land and raise and consume all their wheat, corn, vegetables, etc. To visit their large kitchen and dining hall and see eight or ten hundred pounds of meat and the great bakery, turning out hundreds of loaves of bread for each meal, besided bushels of onions, potatoes, turnips, etc., to feed sixteen hundred seated at the table at once, one would judge it is no ordinary family Tuskegee has to provide for. The dairy contains one hundred and seventy-five milk cows, and last year they made 16,332 pounds of butter. Every cow has a name and a stall as cleanly kept as care can make it, the students study the cow, the milk, the butter, as well as the food. The whole analysis of the dairy is studied to protection and the results are no dairy in the country can excel it. The students make the furniture used in the buildings, such as bedsteads, dressers, washstands, chairs, tables, book cases and mattresses, and nowhere have we seen schools so well furnished as the building at Tuskegee. The machinery, wagons, plows, buggies, harnesses, etc., are all manufactured on the grounds. Last year the tailor shop turned out over 1,000 new pieces: the millinery 1,412 hats and other articles; the dressmaking 1,309 pieces, besides 2,300 pieces of plain sewing, and the mattress division 5,118 mattresses. 1,367 brooms and baskets were manufactured. Besides Tuskegee makes its own brick and builds all of her own buildings. Among her students are all grades of mechanics such as architects, stone masons, brick layers, carpenters, tinners, plasterers, painters, etc. They have one of the finest electrical plants that can be found anywhere. All the instruments are installed, lines run and buildings wired and lighted by her own boys; in the foundry they mould all castings in use. The landscape gardener has charge of the greenhouse and the grounds are as artistically arranged as in any city in the south. The young men are organized in a regiment of cadets and are drilled in the latest methods used in the United States army. Special attention is given to gymnastics for the young women and they have a well arranged gymnasium filed up and two large pools are connected with the men and women’s dormitories. The Library building is the gift of Carnegie; the architecture is colonial and cost $20,000; It is two story and ais 50 x 110. An effort is being made to secure every pamphlet, book, newspaper, magazine and other works published by our people, so that this library will be the center of Information regarding literature published by the race. The Bible training school has an enrollment of seventy-three this year and has sent out fifty three graduates. The chapel seats over 2,000 persons and it is one of the grandest delights to see the auditorium filled with young men and women, and their choir of over <..can’t read number…> voices accompanied by the orchestra of 18 pieces, all join in singing anthems of praise to our God, who has redeemed us and given us such a privilege to worship him under the guidance of Tuskegee. The constant aim is to correlate the <…> and industrial training that the student cannot get one without the other; hence the students go to school one day and the next day works at his trade and skill to accommodate all, the school is operated day and night. You never find an idler in Tuskegee, every hour must be accounted for. There is a great demand for the “Tuskegee graduates. A position awaits them and as soon as they receive their diplomas they are placed at the head of some enterprise. The Tuskegee school opened about twenty-five years ago in a rented house with thirty pupils; today the total value of property, equipment and endowment is about $2,075,000 with an annual payroll of $102,152.03 for teachers’ salary and current expenses. Tuskegee is not only a great manufacturing school, but is is the great money center, and it is the magnet that has attracted the wealthiest and best people of the land. At the head of this institution stands Prof. Booker T. Washington, who has made the school the greatest normal and industrial institution of the age, and year by year he and the school have increased in popularity and usefulness, and before them stand today a vast multitude of people anxious for a continuance of this great work. Miss Mittie Halfacre, of East Franklin, who has been spending some time in Nashville, has returned home and entered upon her school work last Monday morning. Miss Lula Halfacre, who has been visiting friends and relatives at this place and in Nashville, has returned to Rochester, New York. Araminta “Mittie” Halfacre was born in March of 1876 in Tennesse. She is the daughter of Archer & Peggy Halfacre. Lula is her sister, (born in October of 1877). See the family in the 1870, 1880, 1900, 1910, 1920 census records. They were the eldest of many children born to the couple. Mittie died May 8th, 1915 in Williamson County. Her mother, Peggy, died March 11th, 1915. Mrs. P.J. Ewing entertained in honor of Mr. and Mrs. J.S. Williams and their little daughter, Ethel. Those present were Mr. and Mrs. J.S. Williams, Mr. and Mrs. Sam Harris, Mr. and Mrs. Mack Balke, Misses McCants, Eugenia C. and Mattie D. Walker; Messrs. Scott, Smith, Andrews, Sawyer, McFall and King. The hostess did all in her power to make things pleasant. At half past eleven they were ushered into the dining room, where a two course menu was served, after which many lovely toasts were given. Mrs. Williams left the next day for Birmingham, Ala., Mr. Williams for Chicago. We wish them much success and hope to see them next fall. Mrs. Sam Harris left for Kansas City, Kan., to visit her mother. Dr. C.V. Roman, the talented specialist, will address the Allen Christian Endeavor League at St. John A.M.E. Church Sunday evening at seven o’clock. Dr. Roman is one of the leading thinkers of the age. He has traveled and studied abroad, and is clean reasoner and a pleasant entertainer. It is always a rare treat to hear Dr. Roman and no one can listen to his words of instruction without being benefited. The endeavor league is making strenuous of the National Convention of Endeavors in July, and they feel highly complimented in having Dr. Roman to address the league on next Sunday evening at seven o’clock. At the end of June/beginning of July, I was on vacation and my family and I did various things around Nashville – one of those items being a trip to Fisk University. My husband wanted the kids to see the HBCU campus and we talked throughout the day about the importance of education. 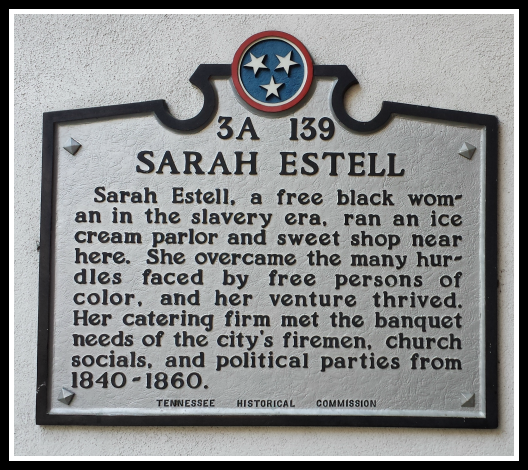 I found the trip very rewarding, for it has helped solidify my interest in blacks in Nashville and helped me further appreciate the rich history here in town. I blogged about our trip on my main blog. It was neat to walk the campus and hear the history, and hear many names that I’ve learned of through my activity on this blog. For example, now that I’ve seen and been inside the Fisk Memorial Chapel and learned of it’s history, it makes it easier to place stories like the report on the Merchant of Venice production in a more real setting. I hope to continue to learn even more as I continue this project.